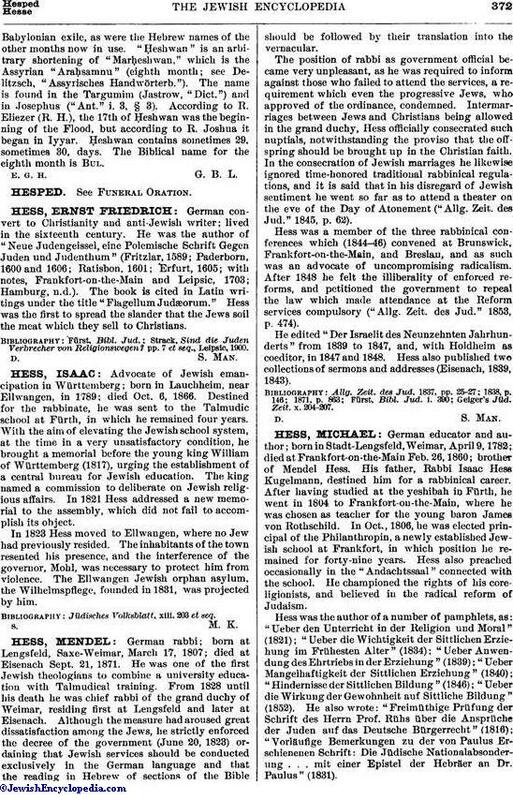 Advocate of Jewish emancipation in Württemberg; born in Lauchheim, near Ellwangen, in 1789; died Oct. 6, 1866. Destined for the rabbinate, he was sent to the Talmudic school at Fürth, in which he remained four years. With the aim of elevating the Jewish school system, at the time in a very unsatisfactory condition, he brought a memorial before the young king William of Württemberg (1817), urging the establishment of a central bureau for Jewish education. The king named a commission to deliberate on Jewish religious affairs. In 1821 Hess addressed a new memorial to the assembly, which did not fail to accomplish its object. In 1823 Hess moved to Ellwangen, where no Jew had previously resided. The inhabitants of the town resented his presence, and the interference of the governor, Mohl, was necessary to protect him from violence. The Ellwangen Jewish orphan asylum, the Wilhelmspflege, founded in 1831, was projected by him. Jüdisches Volksblatt, xiii. 203 et seq.